The seal on the front of this journal is significant, and let me tell you why! It reminds me of something very important. Deep down in many of us there is a little child that longs to be a prince or princess. And here is the great secret. We are! Maybe not in the manner in which one would think of ruling over a country and wearing fine clothes. But each one of us has some things over which we can rule. Our wills and our character. Everyone has a secret royal identity discoverable through relationship with our Heavenly, Kingly Father. We have each been given the ability to choose and receive beauty instead of ashes, light instead of darkness, truth instead of lies. I believe we are all created to live as sons and daughters of this Benevolent King. There are just many who have never met their Kingly Father and discovered he is good; never stepped under the banner of his love and forgiveness, which reveals their royal identity, purpose, and destiny. This King is the best designer in all the land. And he is offering us a crown! I hope mine is sparkly! The JBalyeat Small Journal Notebook is now for sale on Etsy and coordinates perfectly with the JBalyeat Custom Monogram Notecards available on jbalyeat.com. It makes a delightful favor for a party, addition to a gift basket or Christmas stocking, or a little piece of lovely convenience…just because! The crown is also available printed on fabric via Spoonflower. 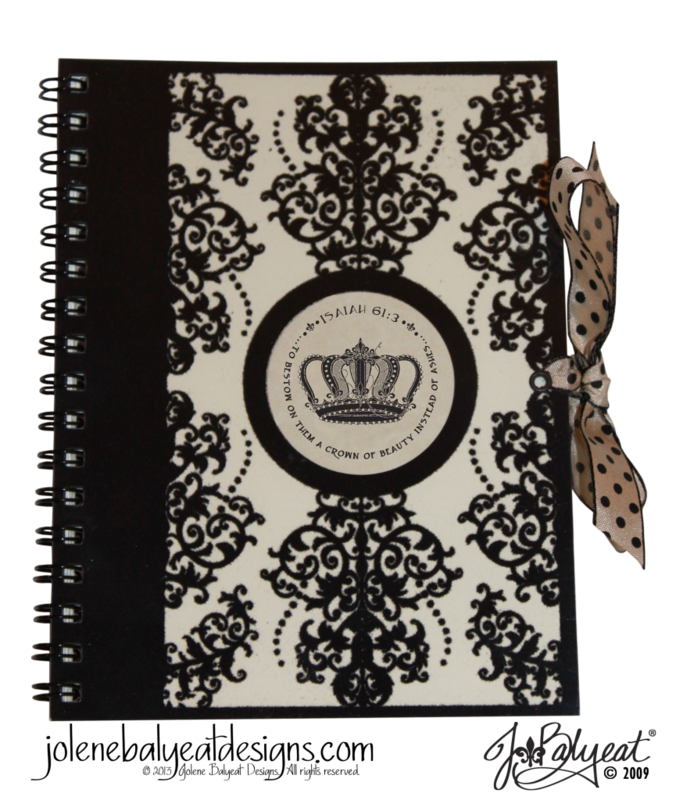 Measuring approximately 4.75″ x 5.75″, this handy notebook fits perfectly in a purse or the glove compartment of the car. Many times mine has come in handy when needing a place to capture a thought, reminder, list or a piece of paper on which to jot a quick note with a phone number, take notes in a meeting…or even write notes in a meeting for that matter 🙂 There is a clear plastic shield on the front and back that protects the flocked damask cover where attached ribbons secure the ivory pages that are bound inside.